I picked up the TF-17 HMR today and snapped a few quick pics of it. The trigger is right at 2lbs and feels great to me. Definitely on par with any of my tuned CF triggers. The rifle is a little heavy for rimfire standards--with the Leupold VX1 4-12 and Burris z rings (low) it is just under 9.5lbs. Honestly I like some weight, though. The stock is a little lighter and softer than expected...definitely looks different than anything else I have, but the cut and finish are nice. It definitely handles well being so short. I also dig the charging handle. 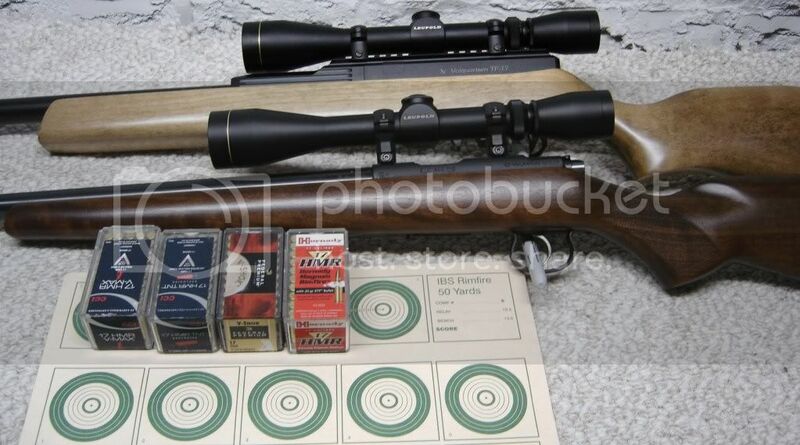 Anyway, I'm going to post a range report this weekend or next (it looks like it is going to be in the 20's this weekend) and pit it against my CZ 453 varmint. I realize that these are different guns, but both are heavy barreled HMR guns and a little competition is always a good thing. Nice looking rifle ! I will be looking forward to your range report . I have been looking at those too . I might NEED to get one of those !!! Maybe two , one in 17 HMR and one in 22 Mag ???? Thanks for posting the pictures ! Great looking gun! Looking foward to your range report. 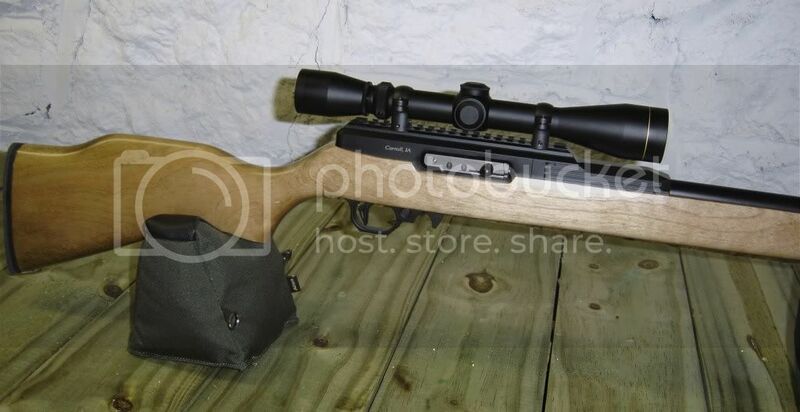 Forgot to ask, how is this model different then, say, their regular .17 HMR semi's? Check out VQ's site for some more info...note that the TF series is much cheaper as well despite the same barrel and trigger. OK folks...After a few weeks of temps in the 20's and snow I decided to go to the range and give it a try. Here's the initial target. I'll post some commentary here tonight, but basically it was 25 and breezy, so the booger flicker was cold. I only fired about 50 rounds, most into this target. In short, it shoots well enough that I'm interested. The trigger is great, I like the heft (shots feel very "tick, tick, tick"--zero motion on the gun). The sighter has the usual low/high bracketing, but with a SOLID group once dialed in. The top row is all federal 17gr V-max and I hope the horizontal stringing is the wind. I don't think I was dragging wood. The second row is all CCI 17gr V-max and while the groups are alright there is 1 wild flyer in each group. I know the flyer in the 1st and 2nd group was the first shot, not sure about the 3rd. So hopefully this was due to the temps. 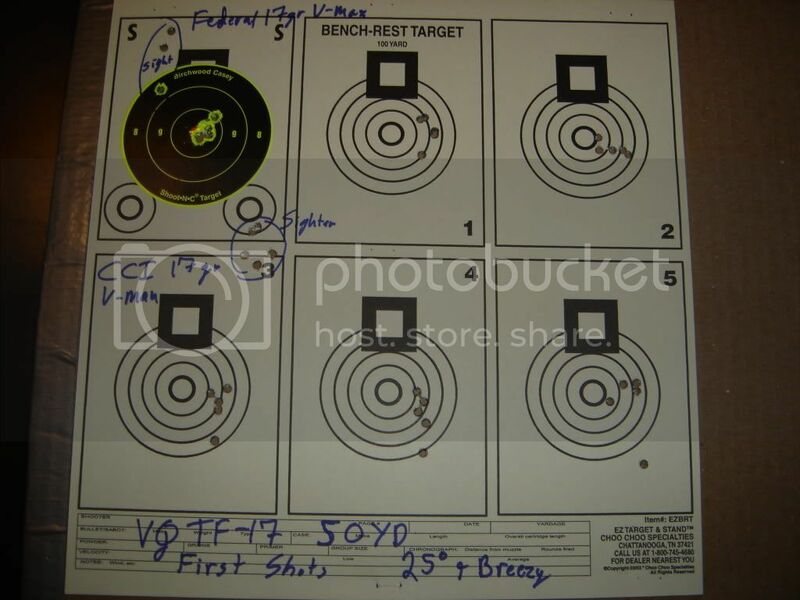 I don't think there is any difference between the CCI and Federal ammo except lot number, so they should have been the same. Anyway, more commentary to come. It needs to warm up here so I can enjoy this gun a little more. Any gun that prints .17cal rounds touching is interesting in my book. Last edited by guckrob; 01-22-2011 at 06:24 PM. What a find. A semi in HMR! Like you, I bought a 453. But for shooting running digger squirrels, this is tops. On my gotta have list for sure. I know this is a really old thread, but I'm getting rid of a few guns and this is going to be one of them and I thought I'd offer it up here first. I'll take some pictures of it as it looks right now, but it is still is pretty much mint condition as the original pictures and as near as I can piece together has under 300 rounds through it. It was a little over $1k when I bought it and the scope was probably $250. 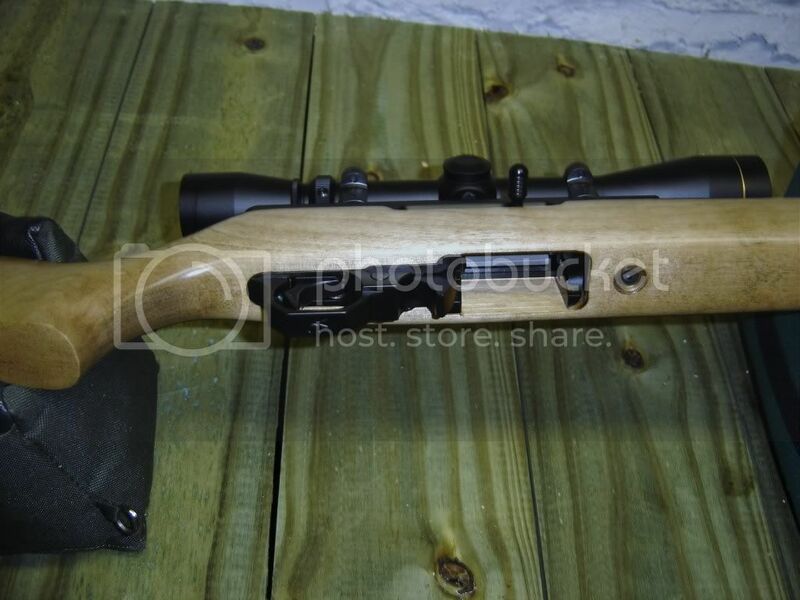 I would like to sell it with the scope because I've already got a few scopes still in boxes. If you are interested PM me an offer--I'll post it in the classifieds here in the next few days. I'm in Central KY if that matters, but I can/will ship to your FFL.